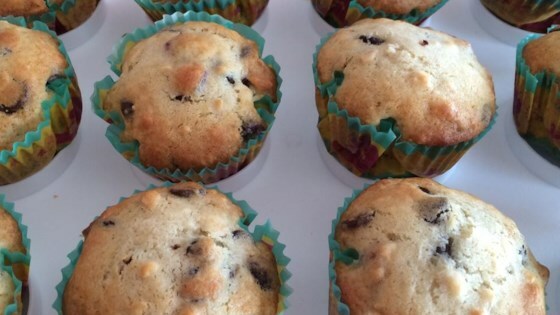 "A very scrumptious muffin with lots of chocolate chips and blueberries in every bit of this muffin which would be good for breakfast or brunch." Mix flour, baking powder, and baking soda together in a bowl. Whisk cream, sugar, chocolate chips, eggs, oats, and blueberries together in a separate bowl until well mixed. Stir flour mixture into cream mixture until batter is well mixed; pour into the prepared muffin cups. Bake in the preheated oven until a toothpick inserted in the center of a muffin comes out clean, about 20 minutes. Cool muffins in muffin tin for 10 minutes before removing to wire rack to cool completely. The worst muffins ever. The texture is disgusting. First time I picked a nasty recipe from this app. I might cut down on the chocolate chips next time, but otherwise, they are delicious!! I did 6 muffins with mint chocate, 6 muffins without, all with brown sugar. Perfect!